Ah yes, and as you left out for simplicity sake, there are certain frictional costs that make market timing that much harder. This includes bid/ask spreads, commissions, and capital gains taxes. Even tax losses have the hitch that you can't get back into the same shares for 30 days or else you have your losses declared superficial. Again, I know you just left the details out for simplicity... unless I just blew part two. Gene: All true. I had no part 2 planned -- so you didn't spoil it for me :-) Other complicating factors are the interest on cash balanced against lost dividend payments while the market timer is out of the market. Michael, when do you get to say "told you so" to the market timers who just missed out on a 16% uptick? Patrick: I'm just going to avoid saying "I told you so" altogether. In the post I was careful to say "let’s assume for the moment that stocks are now on the rise" and "if stocks continue to rise ...". 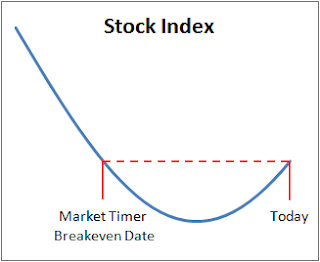 Even if stocks double over the next year, there is no guarantee that they won't come back down again making the market timers who remained out all that time temporarily "right".